Advantage Payment Systems (“APS”), highly regarded for the “Advantage ACH” payment processing platform that includes VeriTrac database verification dedicated to the storefront and Internet based short-term lending industry, is pleased to announce that it has merged with San Diego based and nationally known Secure Payment Systems (“SPS”). ADVANTAGE ACH- PLEASE READ BOTH ! Advantage Payment Systems ("APS"), highly regarded for the "Advantage ACH" payment processing platform that includes VeriTrac database verification dedicated to the storefront and Internet based short-term lending industry, is pleased to announce that it has merged with San Diego based and nationally known Secure Payment Systems ("SPS"). In addition to having utilized pieces of SPS back-end systems over the last year to augment our own processing capabilities, by virtue of this merger Advantage ACH is now able to fully provide many other specialty payment services through SPS so as to meet changing market needs instead of building our own, including but not limited to offering Canadian ACH services, check 21 image capture, as well as international remote check capture and clearing. Advantage ACH will continue its usual operations, staffing, and support as a separate but wholly owned subsidiary of privately-held SPS whose CEO, Linden (Lin) Fellerman, has been involved in payments for over 35 years, and whose background most recently includes 16 years as Founder & CEO of SPS as well as 20 years at Telecredit/Equifax/Certegy where he was President of the Check Services business unit for the 10 years preceding his founding of SPS in 1996. For many years SPS has been involved in numerous ACH payment processing and check clearing/imaging activities for their own set of over 7,500 client locations worldwide so we are fortunate to have found such a well-respected partner, known for business integrity, outstanding customer service, and innovative technology to achieve creative solutions for specialized client payment processing requirements wherever transfer of funds may occur. First New Combined Service Offering!!! 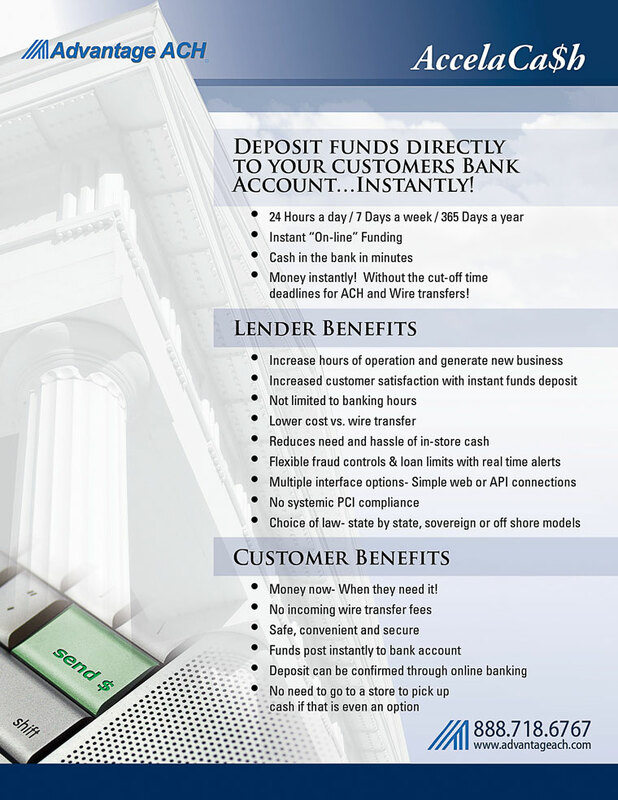 Advantage ACH / SPS is pleased to announce that it has signed an exclusive contract with Florida based Adaptive Payments whose unique "instant funding" debit card solution is revolutionizing the way lenders can get cash into the hands of borrowers. Rather than wait for overnight ACH credit, borrowers can have funds immediately credited directly to their ATM card, for which Adaptive has already obtained more than 60% participating ATM network coverage across the U.S. (and growing monthly as additional ATM networks come online). For online lenders or storefronts alike, this is a solution that many of you have been clamoring for, and now it is here. Via either an API integration or a simple Advantage / SPS single entry web interface (or both) lenders can now safely and expediently send cash directly to their customers in less than 5 minutes. More importantly, this service is available real-time 24 hours per day, 365 days per year … Your customer can get cash at 10 pm or 4 am … There are no processing time "cut-offs" like the ACH world must deal with. Our arrangement with Adaptive encompasses the third party processor industry so we will have a tremendous edge in offering this directly to you now before the queue to get on board creates a delay to market entry. Certain underwriting documents will be required, however the good news is that we already have the vast majority of that on file given our years of processing for you. Please note that the “instant funding” sponsor is a bank specifically sponsoring Adaptive’s origination of items into the ATM debit network, and is not in any way related to an ACH sponsor bank that may be experiencing concerns with ACH origination on behalf of online lenders. Please call us immediately at 1.888.718.6767 so we can discuss implementation details, provide demos, and get a contract into your hands for review!. Copyright © 2013 Secure Payment Systems / Advantage ACH, All rights reserved. You're receiving this e-mail because you have opted in to receive e-mails from SPS.